Shrubs are not a new thing but they do seem to be making a comeback. They originated during the Colonial Era as a way of preserving fruit but have since evolved into a refreshing, sweet and tart syrup of sorts, or drinking vinegar as they're sometimes called. The process is very simple and the hardest part is being patient. 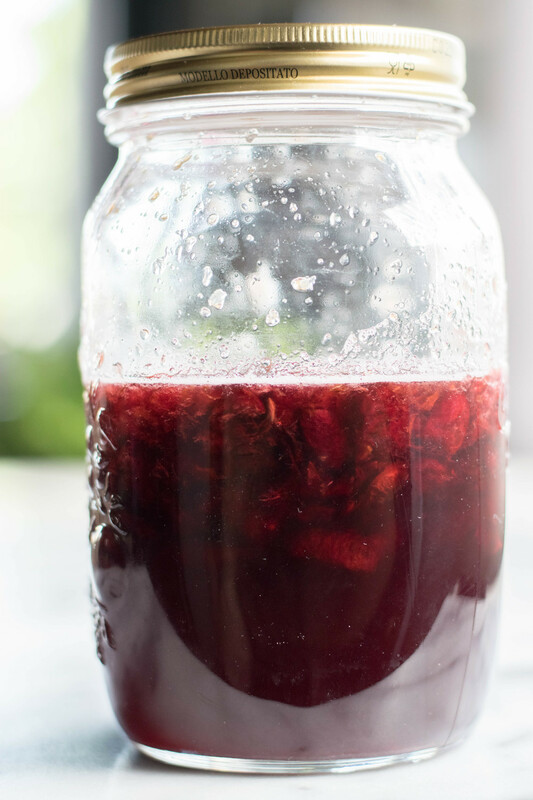 The fruit and sugar ferment together for a few days and become alive (think Kombucha) and then the vinegar is added to stop the fermentation process and help preserve the mixture. Then you can add it to whatever you like! My favorite is simply combined with sparkling water but you can add it to cocktails or even drizzle over ice cream. I predict this will be my new summer obsession. I can't wait to try some other flavor combinations. You can use the below ratio of 2 parts fruit, 2 parts sugar, and 1 part vinegar for just about any fruit you like! I'm thinking basil-peach or ginger-lime next. What flavor would you make? 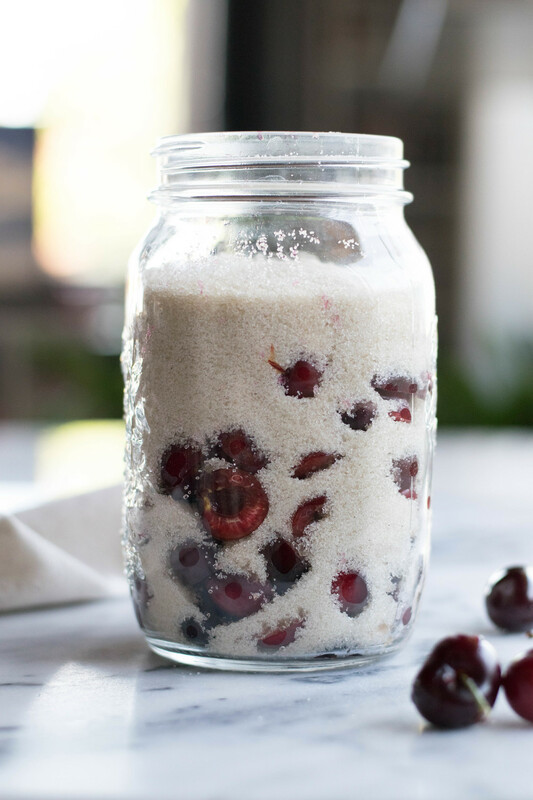 In a large mason jar, combine the cherries and sugar. Using the end of a wooden spoon, muddle the fruit and sugar together until fully combined and some of the cherries' juices are released. Secure the lid on and let it hang out for about 72 hours at room temperature, shaking the jar a few times a day. The mixture should be totally transformed into a syrup and the sugar dissolved. 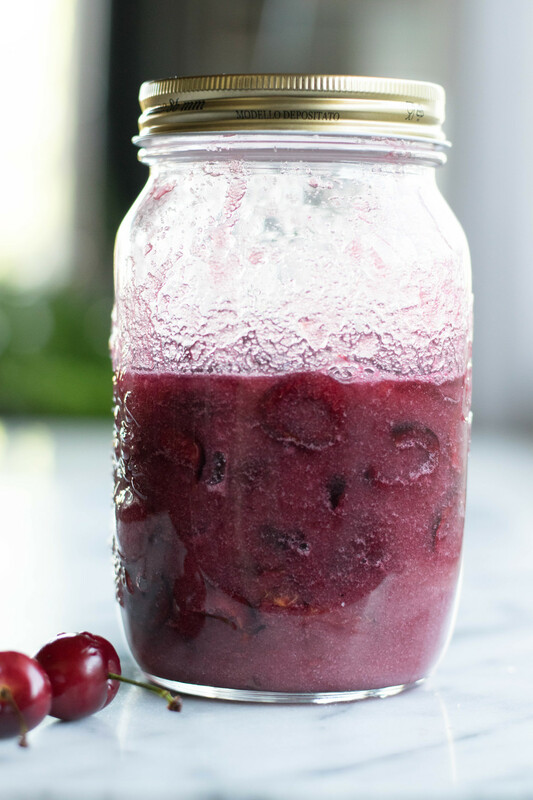 Strain the syrup into a new jar and discard the cherries. Add the vinegars to the syrup and stir to combine. Store in the fridge for up to 3 months. My favorite way to enjoy a shrub is simply combined with some sparkling water. Combine about 1/4 c shrub with 1 cup of sparkling water and add ice. You could also use a shrub as a delicious and unique cocktail add-in.